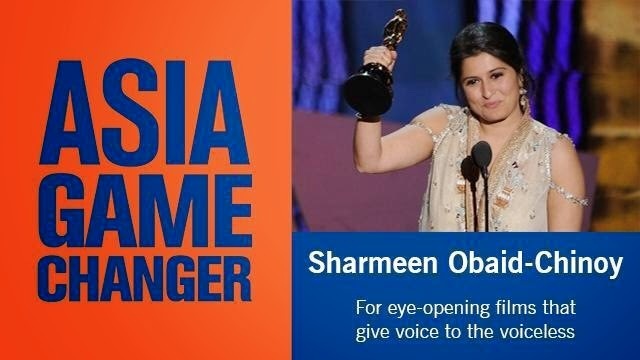 SOC Films today announced that Sharmeen Obaid Chinoy was named by Asia Society as a 2014 Asia Game Changer. The award recognizes those making a transformative and positive difference for the future of Asia and the world. Sharmeen Obaid Chinoy was recognized for eye-opening films that give voice to the voiceless. The honorees will attend the Asia Game Changer Awards Dinner and Celebration at the United Nations on October 16, 2014. Jack Ma, named Asia Game Changer of the Year, will give an address to the gathering. The evening will also feature a special video address from Malala Yousafzai and a live performance by Playing For Change. More information about the awardees, including bios, and the October 16 event is available at AsiaSociety.org/GameChangers. SOC Films is a Karachi based film house specializing in investigative and socially motivated content. With Academy and Emmy award winning journalist and documentary filmmaker Sharmeen Obaid Chinoy at its helm, SOC Films seeks to set a new standard for groundbreaking cinema that furthers the art of fiction and non-fiction story telling in Pakistan. Through the induction of its Karachi office, SOC Films intends to groom a new generation of directors, producers and writers who will be equipped with the skills and training to produce quality films for both Pakistani and international audiences. Asia Society is a nonpartisan, nonprofit institution with headquarters in New York, major centers in Hong Kong and Houston, and offices in Los Angeles, Manila, Mumbai, San Francisco, Seoul, Shanghai, Sydney, and Washington, DC.